Roth IRAs are tax-free, making them popular, but a married couple is ineligible to contribute to a Roth if they earned more than $199,000 of modified adjusted gross income in 2018 ($135,000, if single). A "backdoor" around this limit enables you to convert traditional IRA assets into tax-free Roth IRA accounts, even if you're over the income limit. Here's a strategic approach for maximizing the backdoor route to get tax-free Roth treatment with the least amount of conversion-tax. When you convert a traditional IRA to a Roth account, you are required to pay tax on the income withdrawn from your traditional IRA. If you do not have the cash on hand to pay the extra income tax you'll owe next April 15, you probably should forget about converting now; withdrawing a larger sum to pay for the income taxes is a risky financial bet and is generally unwise. If you have the cash on hand to pay the extra income tax you'll owe in the year you draw from your traditional IRA to make the conversion to the Roth, your next move is maximizing your tax bracket. 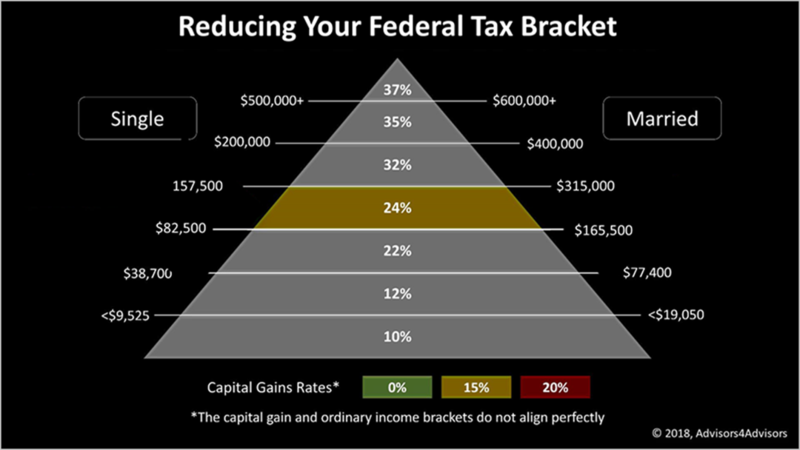 For instance, if your taxable income is $177,500 after making a $100,000 withdrawal from the traditional IRA, consider lowering the amount you convert to avoid pushing you into the 32% bracket. Reducing a $130,000 contribution to a Roth by $30,000 lowers your maximum tax bracket to 24%, for example, giving you the maximum benefit of the 24% bracket. Because of the stock market's performance in 2018, you may be able to convert a traditional IRA to a Roth with little or no tax taxes. If you funded a deferred compensation plan or traditional IRA with after-tax income in late 2017 or 2018, its fair market value may be lower now than the amount you contributed, and you could convert that traditional IRA account to a Roth tax-free! To be clear, if you made after-tax contributions to an IRA in 2017 or 2018 and it's shown little or no appreciation, consider converting that IRA to a tax-free Roth IRA, and because you will owe little or no additional income tax on the conversion and — unlike the traditional IRA — the Roth will create tax-free income upon withdrawal. If you made after-tax IRA contributions to a traditional IRA in 2017 or 2018, or if you want to evaluate a Roth IRA conversion, please contact our office because this is a technical tax topic that requires specialized tax advice.